The Graduate Student Advisory Committee publishes a journal of student writing and artwork. 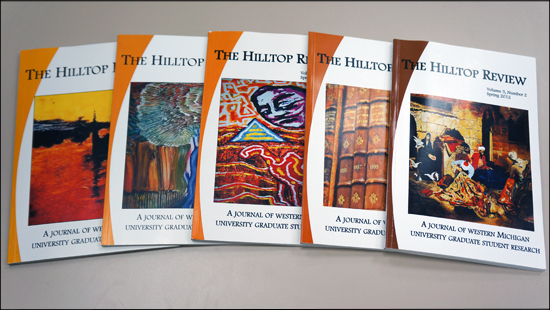 “The Hilltop Review: A Journal of Western Michigan University Graduate Student Research” is a peer-reviewed journal. It is intended to be an interdisciplinary journal which provides a venue for sharing the scholarly and creative activities of graduate students from all disciplines at Western Michigan University. It offers a sampling of original and significant findings. Published in hard cover twice a year since 2009, and electronically since 1995, the journal will be issuing its Spring 2013 volume soon. This issue will include articles “An Explanatory Ethnography of the Gendered Communicative Behaviors of Bouncers,” by Nathan M. Swords; “Youths’ Access to Public Space: An Application of Bernard’s Cycle of Juvenile Justice” by Amanda Smith; “Feminist Research Ethics, Informed Consent, and Potential Harms,” by Melinda McCormick; “Bureaucracy and Income Disparity in America,” by Daniel Dougherty; and artwork by students Matt Klepac and Tess Erskine. A short note from the editor precedes the scholarly works. Josh Berkenpas, doctoral student in Political Science, had the tough but rewarding role of editor for two years; for 2013 we have a new editor, Tim Bauer, a doctoral student in Sociology. Tim has served on the Editorial Board of The Hilltop Review since Fall 2011, and continues to work closely with that board to produce the journal. The board includes graduate students, members of the faculty, and officers of the Graduate Student Advisory Council (GSAC), which sponsors its publication. Tim issues the call for submissions, solicits reviewers, sends the reviewed articles back to the authors for changes, then formats the finished document and sends it to the printer. Copies are distributed to the Graduate Studies Council, the Editorial Board of The Hilltop Review and to current graduate student members of GSAC. Copies of each issue are also sent to the Archives and Regional History Collection at WMU for reference now and in the future. You can see archived copies online at http://scholarworks.wmich.edu/hilltopreview/. The Spring 2013 issue is the first to consider poetry, or what Tim calls “written art.” We look forward to reading the upcoming issue of this outstanding effort by all the contributing WMU graduate students.